Dental Lifeline Network » Be a Lifeline Hero! Lifeline Heroes Challenge is back! From now until June 30th join us in raising $50,000 to support the thousands of people who are elderly, people with disabilities or who are medically fragile that cannot afford dental care. And this year, Dental Lifeline Heroes has a new sidekick—Dentsply Sirona. 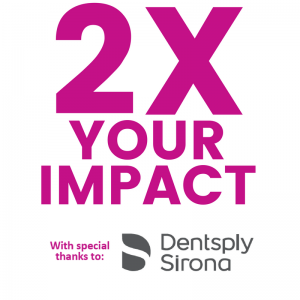 With a generous matching donation of up to $20,000, Dentsply is making your fundraising efforts double in impact! Join other dental industry heroes as they contribute to DLN in a variety of ways from donating dental hygienist fees, bake and yard sales, and asking office visitors to participate in a Lifeline Heroes Challenge. As a Lifeline Heroes Challenge participant, you will have superhero status to impact even more lives. “The need for the care provided by our volunteers is great and donations have a tremendous impact on our ability to meet this ever-growing demand,” said Fred Leviton, CEO, Dental Lifeline Network. DLN’s Lifeline Heroes Challenge launched this spring and will run through June 30, 2018. All monies donated will directly benefit our Donated Dental Services (DDS) program. Will you join the cause? To Join Lifeline Heroes Challenge or continue to fundraise, please visit lifelineheroes.org or contact Matt Yeingst at myeingst@dentallifeline.org to get your fundraising page set up! Check out Dentsply Sirona’s Web page to learn more about their commitment to giving back to the community through other efforts like the Lifeline Heroes Challenge. ABOUT DENTSPLY SIRONA: Dentsply is the world’s largest manufacturer of professional dental products and technologies, with a 130-year history of innovation and service to the dental industry and patients worldwide. Dentsply Sirona’s mission is to empower dental professionals to provide better, safer, faster dental care. That means that as a company, Dentsply Sirona focuses on innovation and education with the purpose of achieving better oral health outcomes around the world. As a leader in the dental industry, the company recognizes the role it plays in advocating for and investing in efforts that improve oral health worldwide and the importance of being a good corporate citizen in the communities and regions in which offices and facilities are located. Visit www.dentsplysirona.com for more information about Dentsply.